Home // At The Range // Ladies Night at Sportsman’s Warehouse – Tonight! 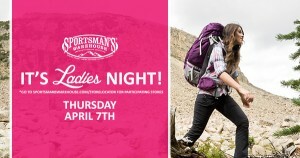 Ladies Night at Sportsman’s Warehouse – Tonight! Deb and I have been invited back to Sportsman’s Warehouse Ladies Night! We will be at the Mesa location from 6 p.m. to 8. We have a great time last year and met a lot of really neat women. We are looking forward to this evening’s fun, educational event and chatting with more ladies from the east valley. Our demo is scheduled to begin at 7:00 p.m.